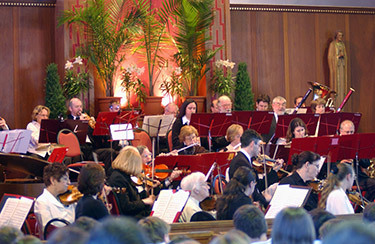 The emphasis of the May 6 concert was "Foreign Lands" and the audience was treated to a whirlwind tour of some exotic destinations, from Gypsy music to Russina Sailor Dances! 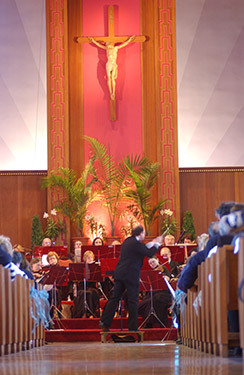 Music Director and Conductor Peter Freisinger was the tour guide for this musical expedition, set in the beautiful St. Susanna sancturary. 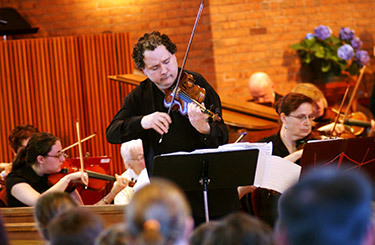 The Orchestra was delight to welcome violinist Victor Romanul, who brought the Sarasate Gypsy Airs to life for us all! 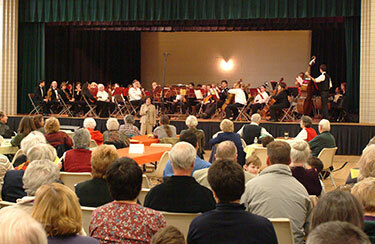 The Orchestra's second very special "guest" was the Avery & Greenlodge Chorus which joined with the Orchestra for several numbers in both halves of the concert and demonstrated a remarkable range of repertoire, from the classic Latin of Dona Nobis Pacem to a rousing African Amani Utupe to selections from My Fair Lady. 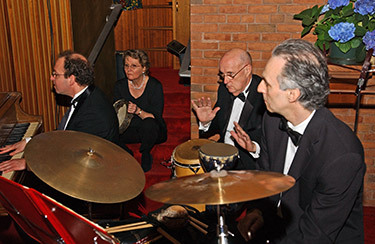 And a third "guest artist" was the Winter Street Jazz Ensemble which provided accompaniment for several pieces. 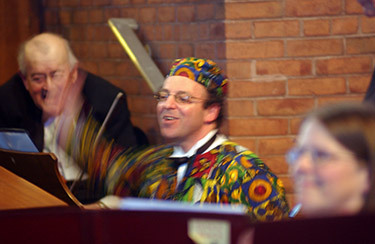 For the rousing Amani Utupe, Music Director Peter Freisinger traded his formal conductor's tuxedo for some more colorful regalia! 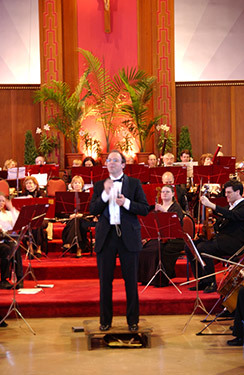 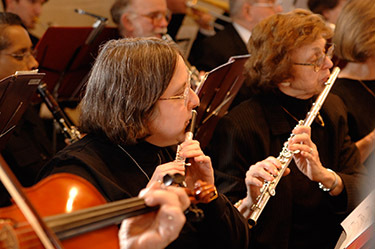 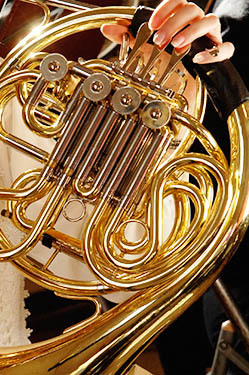 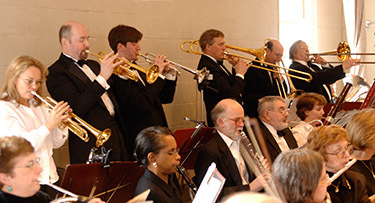 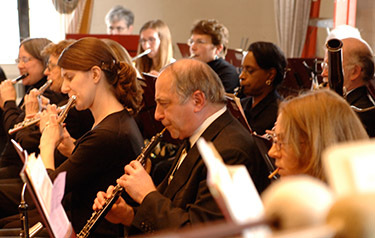 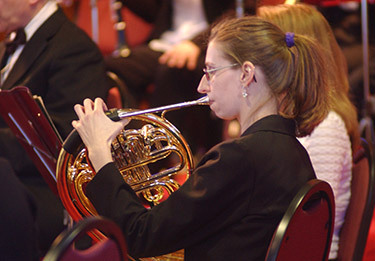 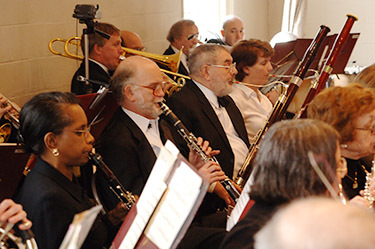 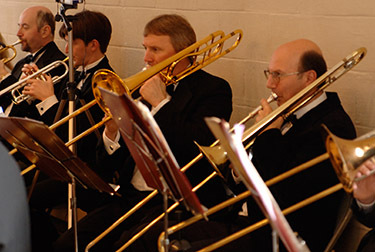 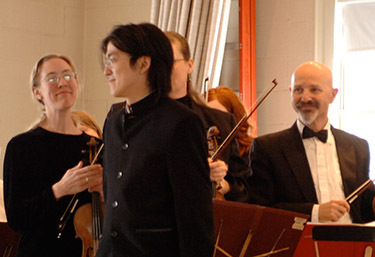 Although the Orchestra’s first concert of 2007 featured Strauss and Sousa prominently, one item on the program stood out as especially noteworthy: the world premier of a work arranged for the Parkway Concert Orchestra by Dr. Chao-Jan Chang entitled The Brave New World. 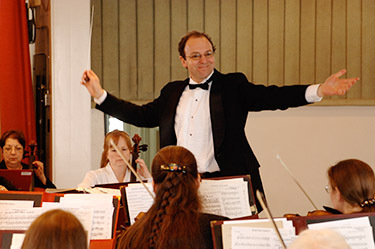 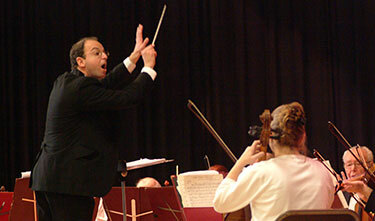 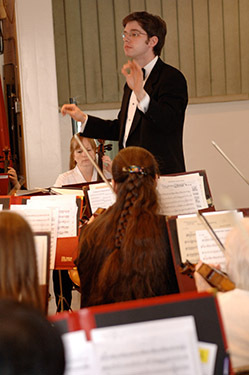 Peter Freisinger, the Orchestra’s expressive Conductor and Music Director (shown below), graciously shared the podium with Jeffrey Means, Assistant Conductor, for Strauss’ Radetzky March. 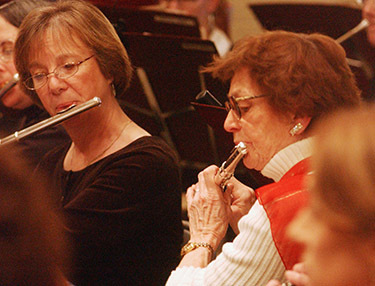 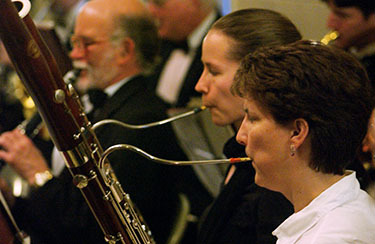 Susan Silverman preformed the sparkling piccolo solo for the concert’s finale: The Stars and Stripes Forever. 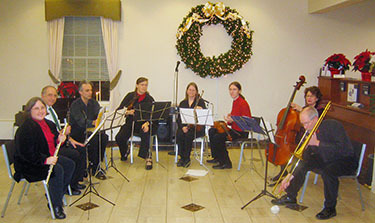 Three ensembles comprised of Parkway Concert Orchestra members performed as part of the Dedham Savings Holiday Program. 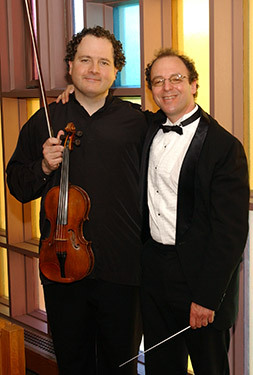 Thanks to Bill Scherban for taking the picture! 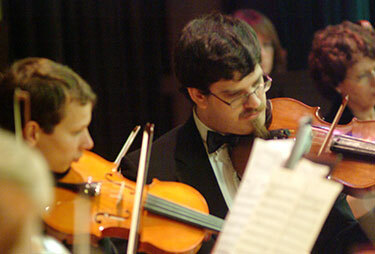 The Parkway Concert Orchestra presented its final performance of 2006 in fine style from start to finish. 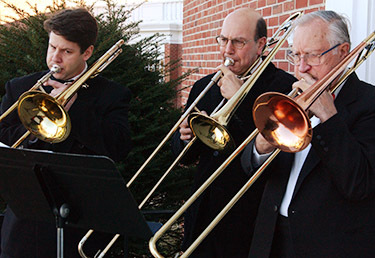 There is nothing that gets one in the mood for a holiday concert quite like being greeted at the door by a trombone trio playing Holiday classics! 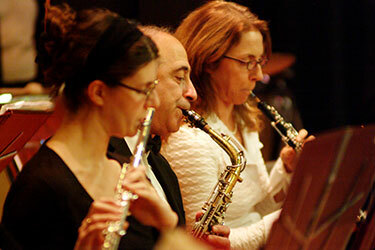 Parkway’s first chair oboe Ian Cohen actuallly divides his talents between single and double reeds. 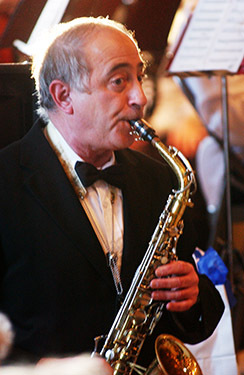 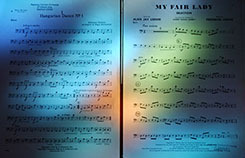 Ian was featured as a guest artist on Saxophone (accompanied by Peter Freisinger on piano) for two pieces - a familiar Western Holiday classic and a dazzliing Turkish song. 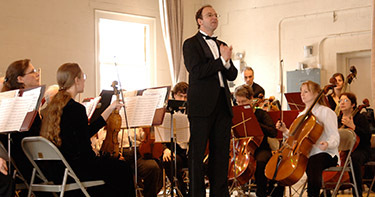 Also featured as a guest artist was Dan Masterson, baritone, who performed several solos with the Orchestra and well as leading two fun sing-alongs. 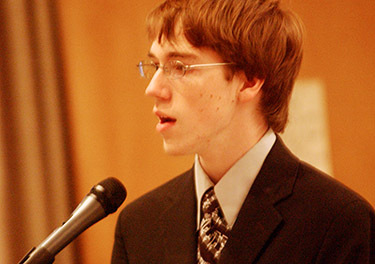 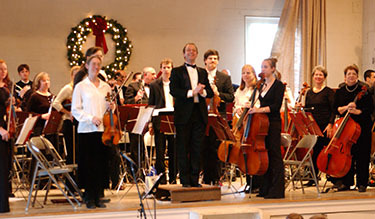 Dan was generous enough to share the stage with three of his siblings: Victoria, Alexandra and Joseph, who were featured in Leroy Anderson’s A Christmas Festival. 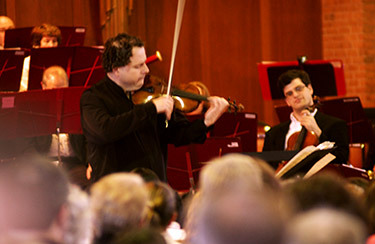 And the faces on stage were similarly rapt! 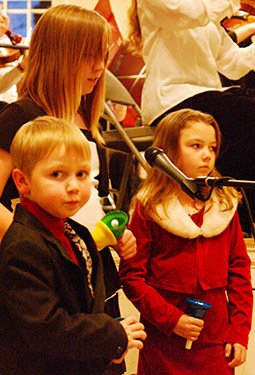 What Holiday concert would be complete without a fleeting glimpse of the “Man in Red” himself? 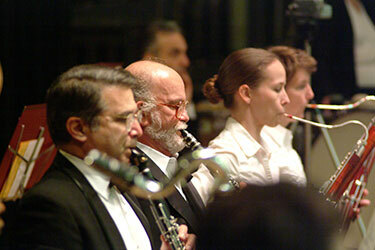 This concert surely did not disappoint. 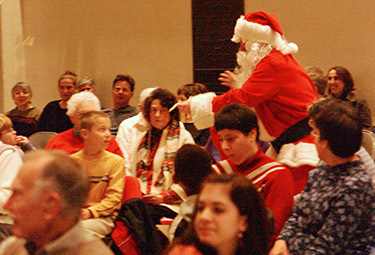 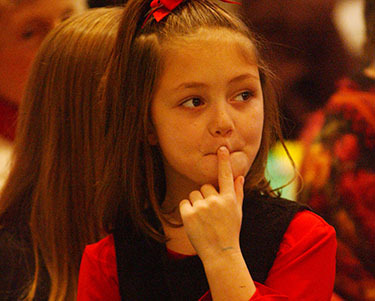 If the weather outside was unseasonably warm, inside it was all Holiday cheer. 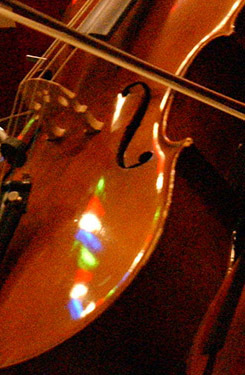 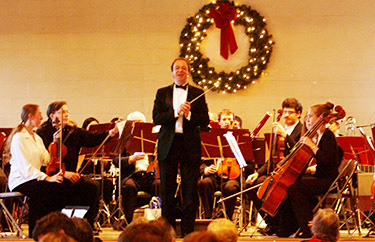 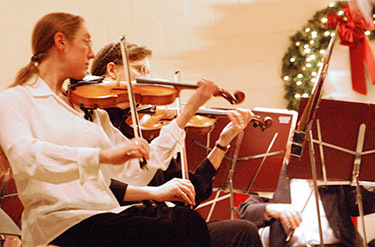 This was a delightful final concert for the Parkway Concert Orchestra’s 62nd Holiday season! 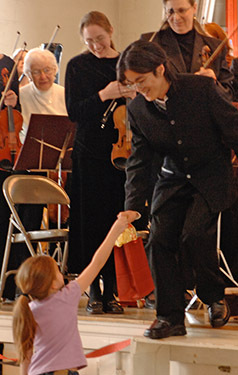 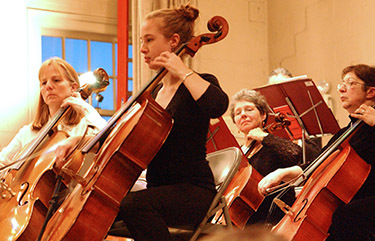 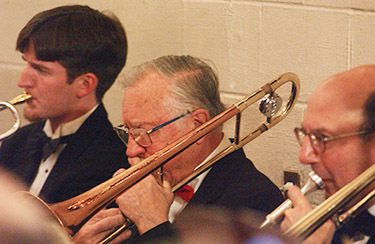 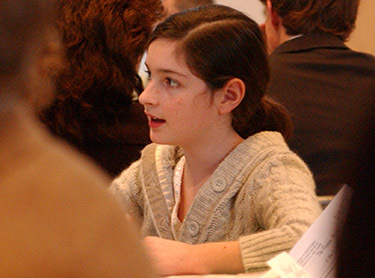 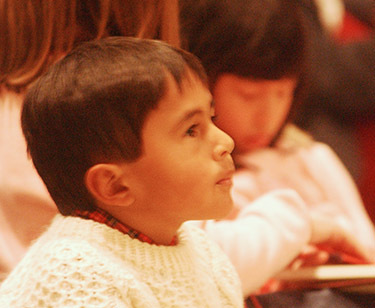 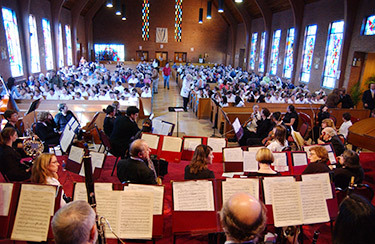 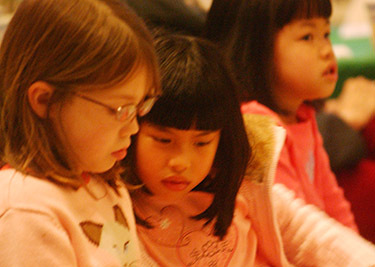 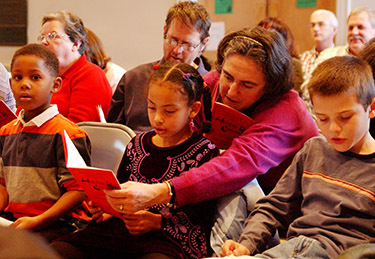 The first concert of the 2006 Fall Season drew an enthusiastic, capacity audience at St. Theresa's in West Roxbury. 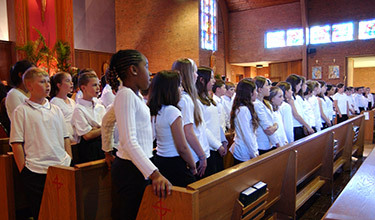 It was announced that there no more seats to put out! 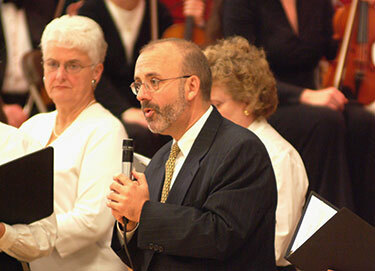 Dr. Richard Bunbury introduces the St. Theresa Parish choirs he directs. 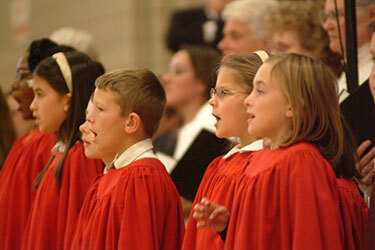 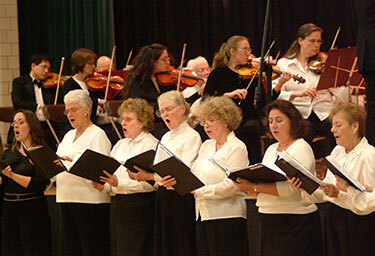 Youth and adult choirs performed excerpts from Handel's The Messiah along with the Orchestra. 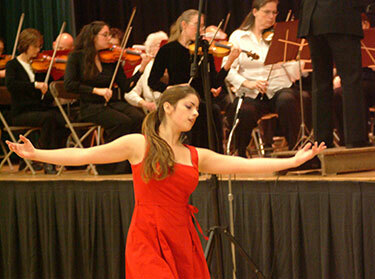 Special Guest Artist Lior Benador danced to Slaughter on 10th Avenue.